I have received several calls concerning wanting to distribution poppies, at a different time other than what Department of Florida has as the normal distribution time Memorial Day and Veteran’s Day. If another distribution date is desired, permission must be granted by the Department President. Once a permanent distribution date is approved by the Department President, it stands as being approved until such time as another new distribution date is requested. Also Units get these “Miss Poppy” out, so she can be active in the community, educating them on what the poppy stands for and showing our Veterans we will never forget. The Memorial Poppy of the American Legion Auxiliary is made by veterans. It is distributed to the public near Memorial Day and all donations received are used only to benefit America’s veterans. The red petals stand for the vast outpouring of blood; the yellow and black center, the mud and desolation of all battlefields. The green of the stem is symbolic of the forests, meadows and fields where generations of Americans have perished to make this land free. The stem represents the courage and determination of our fallen warriors. The assembled product, a flower, is a symbol of resurrection, which is sure to follow. The first step necessary to assure success of Poppy Day is the appointment of a capable, enthusiastic chairman and committee. In selecting a chairman, consideration should be given to her ability to organize the work within the Unit and also her ability to secure the greatest possible cooperation from the community as a whole. Since the Unit’s Veterans Affairs and Rehabilitation and Children and Youth funds are derived from the annual Poppy distribution, it is essential that it be a success. Pin the first poppy on the Mayor and ask him to issue a proclamation setting aside a day as Poppy Day, with an appeal to all citizens to observe the day by wearing a poppy. Volunteer Guide to a Successful Poppy promotion : A special booklet giving detailed directions for the organization and promotion of a successful Poppy Day has been prepared by National Headquarters. The booklet outlines the steps necessary to organize the work force, secure newspaper publicity, win community cooperation, and handle the actual work on Poppy Day. (Copies can be purchased at a nominal price from The American Legion National Emblem Sales. Because our poppy is an emblem of sacrifice, those who love it must make every effort to teach the public the true meaning of the flower. The success of the poppy distribution depends upon the advance publicity. If, in the season of Memorial Day, the poppy can make the indifferent public recall the sacrifices which have been made by the men and women who gave their lives that our country might be saved, the first and greatest mission of the poppy has been fulfilled. The second mission is to win the confidence of the public through knowledge of the purposes to which the American Legion and American legion Auxiliary expend the money derived from the poppy distribution. By means of publicity on the expenditure of the poppy proceeds, public confidence can be won. The public has the right to this information. Every Post ad Unit should see that the poppy proceeds are so spent that publicity will bring honor and reward to our organization. The public should also be reminded that the disabled men and women in hospitals, and their families are assisted by our poppy funds. The public will then know that The American Legion and The American Legion Auxiliary are continuing to keep faith with those who gave their all for our freedom. The following is a suggested outline of activities to precede Poppy Day: Start a campaign of newspaper publicity which will educate the public about the significance of the poppy and the purpose for which the money is spent: organize a Poppy Speakers Bureau through which speakers will be available for meetings of all community organizations to acquaint them with the value of the poppy program, both from the standpoint of therapeutic value to the maker of the poppy and to the community itself. Conduct a Poppy Poster Contest in the local schools and give attractive prizes to the winners. Feature a poppy window display. Window cards, windshield stickers, poppy stamps, poppy lapel streamers to identify American Legion and Auxiliary workers. “Thank You for Caring” poppy leaflets, and offset printing repro sheets can be purchased through The American Legion National Emblem Sales. A list of available supplies is furnished by national Headquarters to every Department each fall. That in the spring of 1919, amidst complete devastation, the poppies bloomed in abundance on the battlefields of France where so many of our men had fallen in battle, and that a replica of this poppy has become the Memorial Flower of the American Legion Auxiliary? That The American Legion was the first national organization to adopt the poppy as its Memorial Flower, having taken this action at the national Convention in Cleveland, September 27-29, 1920? That the American Legion Auxiliary adopted the poppy as its Memorial Flower at its organizing convention held in Kansas City, in October 1921? That at the time the American Legion Auxiliary adopted the poppy, it pledged 100% of the profits from the poppy distribution to welfare relied for servicemen and servicewomen and their families, thus fulfilling the true meaning of the poppy, and emblem of faith; faith which is being kept with all who died through service to the living? That the American Legion Auxiliary, in order to protect the memorial poppy from the inroads of commercialism, adopted a national poppy program at the St. Paul Convection in 1924 which eliminated the commercial poppy? That the memorial poppies are made of red crepe paper, by hand, by disabled veterans in hospitals and poppy workrooms in forty states, and that the workers receive pay for each poppy made, the material being furnished free by the Department in the state in which the hospital is located? That the more than 25,000,000 poppies made by disabled veterans are distributed on the streets under the supervision of the American Legion Auxiliary by approximately 125,000 volunteer workers who receive no compensation? That through the American Legion Auxiliary poppy program, more than $300,000 is paid annually to needy and disabled service men and service women for making the poppies? That proceeds from the distribution of over 25,000,000 poppies annually under the guidance of the American Legion Auxiliary amount to more than $2,000,000, every penny of which is devoted to Veterans Affairs and Rehabilitation work by both The American Legion and Auxiliary, which includes aid to needy veterans and their families? The method of distribution varies in each Department, depending upon the nature of the demands for help. Each of our 10,500 Units in communities scattered all over the United States , its territorial possessions, and in foreign countries where veterans reside, maintains a Veterans Affairs and Rehabilitation Committee working under a chairman, and a Children and Youth Committee with its chairman. These Unit chairmen are assisted by Department chairmen of similar committees, who in turn, work under the guidance of a National Veterans Affairs and Rehabilitation Chairman and a National Children and Youth Chairman. That the public is given an opportunity each year to help in the significant work of The American Legion and the American Legion Auxiliary, as well as an opportunity to pay tribute to all who died in service, by wearing a poppy on Poppy Day? For the rehabilitation of veterans honorably discharged from the United States Armed Forces after April 6. 1917. For the welfare of the families of veterans of the above named date. For the rehabilitation of hospitalized servicemen returning home and awaiting discharge who require treatment in service hospitals. 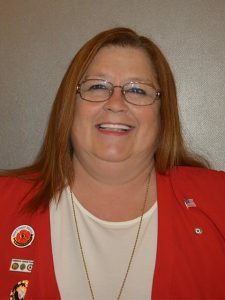 To defray the expenses of Children and Youth and Veterans Affairs and Rehabilitation Chairman in attending authorized conferences at which they are accredited representatives, and the expenses of the Director of Hospital Volunteer Schools to National Conferences, and to defray administrative expenses of Service Department, provided that both The American Legion and the American legion Auxiliary Departments approve such use of funds within the Departments. For Transportation expenses of Hospital Volunteers and the purchase of Hospital Volunteer uniforms, if a Department of the American Legion Auxiliary so desires, as well as expenditures on behalf of the Field Service program, if a Department of the American Legion Auxiliary so desires, all within the limits of the guidelines established by the National American Legion Auxiliary. An award will be presented to the Department Chairman in each division reporting the best Poppy Program. The report should cover all areas of emphasis and any relevant information involving program activity. The report is to be in narrative form and is not to exceed 1000 words. The Department Chairman should sent this report to the Division Chairman by June 20. An award will be presented to the Unit chairman in each Division reporting the best Poppy program. The report should cover all areas of emphasis and any relevant information involving program activity. Units must order a minimum of 750 poppies. The report is to be in narrative form and is not to exceed 1000 words. The Department Chairman is to send the winning entry to the Division Chairman by June 20. An award will be presented to the Unit Chairman in each Division reporting the most unique use of the poppy. The report should be in narrative form and is not to exceed 1000 words. The Department Chairman is to end the winning entry to the Division Chairman by June 20. NOTE: Any article, poster or scrapbook that is submitted for judging must have return postage included if you wish to have it returned. No returns will be made if postage is not included. Units shall sponsor contests in local schools. When schools do not conduct activities, other youth groups, including Junior members, may participate under direct supervision of the unit. A student recommended for special education classes but who has not been admitted due to a waiting list or various other factors. A child identified as having a disability, but not in a special education class due to lack of facilities. Identification contingent upon discretion of school officials. Each poster shall have a fitting slogan not to exceed 10 words. Articles— “a,” “and,” “an,” “the” — are not to be counted as words. The words “buddy” and “buy” cannot be used. The words “American Legion Auxiliary” must be used in the design of the poster and will not be counted in the 10-word count. Each poster must include a picture of the red Flanders Field poppy. The department shall determine the closing date for the unit contest. The poster shall be on 11×14″ poster board. (Drawing paper will not be accepted). The United States flag may be used as long as there are no infractions of the flag code. Media used shall be watercolors, crayons, powder or oil paint, handmade paper cutouts, ink or textures, acrylics, pencils and markers. Written in ink on the back of the poster (not attached) shall be the class in which the entry is submitted, the name, address, age and grade of the contestant and the name of the department. Submissions become property of the American Legion Auxiliary. Through submission of artwork, contestants and their legal guardians’ grant non-exclusive reproduction and publication rights to the works submitted and agree to have their names and artwork published for commercial use without additional compensation or permission. The poster shall be the work of only one individual. The label “in Memoriam” from the veteran-made poppy may not be used. When the Holy Cross is used, the Star of David also shall be used. Each department shall establish its own procedure for judging. A citation will be given for the most outstanding poster in each classification within the five divisions. Unit members should follow deadlines and process for the department. All department adjudicated entries must be sent by the department chairman to her national division chairman postmarked by June 1, 2017. While ALA representatives will do their best to return all posters, it is not guaranteed. We recommend participants take a picture or scan their poster for their records. Submissions become property of the American Legion Auxiliary. Through submission of artwork, contestants and their legal guardians grant nonexclusive reproduction and publication rights to the works submitted, and agree to have their names and artwork published for commercial use without additional compensation or permission. Participant must between six and 18 years of age and be a Junior member in good standing of the American Legion Auxiliary. Promotional activity of the Poppy story must occur through the American Legion, the American Legion Auxiliary and the community. Selection of Miss Poppy is at the discretion of the unit. For National Miss Poppy consideration, participant must submit a Miss Poppy scrapbook (8 1/2″ x11″) containing photographs and clippings illustrating how she promoted the American Legion Auxiliary poppy in her department. Only those scrapbooks that contain a self-addressed envelope with postage will be returned. Although every effort will be made to return the scrapbook, accidents do happen, so all entrants must allow for that risk. Costume (there is no specific dress code or particular dress color for Miss Poppy). Promotion of the Poppy Program: What did you share and do? Publicity of poppy activities (newspapers, radio/TV, etc.). Essay on “Memorial Poppy” not to exceed 100 words. The memorial poppy must be visible in all promotion and publicity submitted. Cover page to include member name, unit name, state, age division and year. Judging scale should be 1 through 10 for each area of judging for entire entry. Little Miss Poppy (age 6-12) and Miss Poppy (age 13-18) winners will be invited to appear at the 2017 National Convention in Reno, Nevada, immediately following her selection, and if she so chooses, will travel at her own expense. Winners of the National Miss Poppy contest each will receive a citation plaque. Please follow department guidelines for submitting entries. The department Poppy chairman should submit the name, address, unit and department of the contestant to her national Poppy chairman by June 1, 2017. If the Poppy scrapbook is to be returned, members must include a self-addressed, stamped envelope. Although every effort will be made to return the scrapbook, accidents do happen so all entrants must allow for that risk.